Bathe surrounded by the elegance beauty of granite, secure in the knowledge that your contemporary, luxurious GraniteLoc bathtub is an affordable indulgence. Crafted from natural granite and other stones, GraniteLoc is a revolutionary product that provides the look of solid granite slab at a price about 25% less than granite slab. GraniteLoc is a unique and proprietary system with two patents and three more pending. The unique process creates a dead-flat surface using granite or marbled tiles. The tiles are fused together using color-matched poly-resins that resist stains. Additionally, GraniteLoc is sealed during the manufacturing process, boosting its stain-resistant powers and ensuring that the surface remains gorgeous with minimal maintenance. GraniteLoc is available in a wide variety of standard colors, and you can also order custom combinations that allow you to mix and match both colors and patters. In addition to being ideal for creating stunning tub surrounds, GraniteLoc is ideal for vanities, kitchen countertops, tables, desks, wall cladding, and many other household and commercial design features. 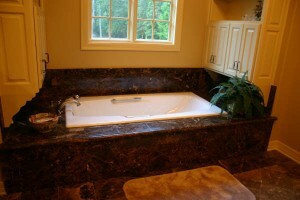 GraniteLoc is highly functional, contemporary and elegant in design, and is an affordable alternative to solid granite. Additionally, GraniteLoc is lighter than slab, which makes it an ideal solution for remodeling as well as new construction. For more information or to find a distributor near you, see www.GraniteLoc.com or call the company’s Tyler, TX headquarters at 903-535-9000.